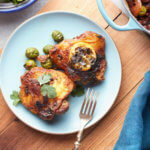 You don't need a special pot to make this chicken tagine with ginger and almonds dish. Rather, you can use any large casserole dish for making tagine without a tagine pot. This Moroccan recipe combines chicken, onions and tomatoes with aromatic ingredients like saffron, ginger, parsley and almonds for an exquisite flavour in every mouthful. Once you've cooked the onion, you will need to add the chicken and other ingredients, then just let it cook for about an hour or until the chicken is done. At the end, stir in some honey to add a sweet touch, then serve garnished with colourful and crunchy ingredients. This is good served over rice or you might prefer couscous, bulgur wheat or another grain. 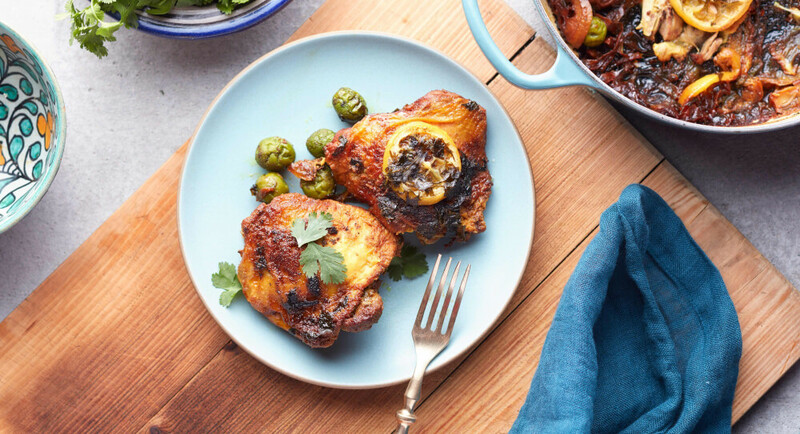 Everyone will be impressed with the results of this tasty chicken tagine with ginger and almonds recipe because it's so well balanced and the flavour is seriously good. This recipe makes six servings. Spice it up with some hot chillies if you want! 1. Warm the oil in a big casserole dish over a moderate heat. 2. Cook the onion in there until tender. 3. Add the tomatoes, ginger, saffron, chicken, herbs and cinnamon. 4. Cook over a low heat for an hour, without a lid, turning the chicken every 20 minutes. 5. Check the chicken is no longer pink in the centre. 6. Stir in the honey. 7. Divide the tagine between 6 warmed serving plates. 8. Garnish with the sesame seeds, almonds and fresh coriander.